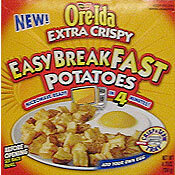 The full name of this product is Ore-Ida Extra Crispy Easy Breakfast Potatoes. The "Easy" part is definitely true. Basically, you chuck it in the microwave for four minutes and you end up with a fine breakfast side dish. However, I do take slight issue with the "Extra Crispy" part of the name. They would better be called "Easy Occasionally Crispy Breakfast Potatoes". That's not a bad name right? In fact, I like it a little better. These are little potato chunks. "Extra crispy" is a fantastic way to enjoy hash browns, but when you're dealing with chunks (ala home fries), it's best to keep a little potato texture... somewhat crispy on the edges and soft on the inside... like little square French fries. If you agree with that sentence, you'll probably like these potatoes. You might be slightly put off that the amount of potatoes seems small in comparison to the size of the box. Each box contains two servings. There's approximately 80 potato pieces a box. Each piece is roughly the size of two stacked nickels. If you transfer the potatoes to regular-sized coffee cup, it almost reached the top. Now, I'm a big guy with big bulging muscles and nice smile. And one-half of a coffee cup of potatoes is not my idea of a serving. So bear in mind - in realty, the way most people eat - one box is a little too much for one person and little bit skimpy for two. The reason the box is so big is that it's technological marvel. The underside of the bottom is actually a microwave reflective surface. You tear off this portion of the box and place it closer to the surface of the potatoes to achieve optimal crispness. If you've bought more than ten microwavable products in the last four years, you've probably already encountered this wondrous science. 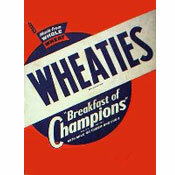 As for taste, they're nearly diner quality. No special spices or flavoring... just good old potatoes. Most consumers will never be aware of the most interesting aspect of this product. In small print on the back of the box, it says "prepare an egg or bacon in the box (with the potatoes)" and it directs you to oreida.com for more details. I was pleasantly surprised that the recipes actually worked. The results weren't as good as a breakfast made in my trusty iron skillet, but it did make microwave cooking seem fun. I'd like to see Ore-Ida have a promotion to encourage people to come up with new recipes. As for the healthiness of Ore-Ida Easy Breakfast Potatoes... come on, if you're on a diet, you know you have to cut back on hash browns and stuff. This is once-a-week, maybe twice-a-week, indulgence. In fact, I was more than a little dismayed to see partially hydrogenated vegetable oil as the second ingredient listed. After the cereal companies led the way in reducing trans fats from America's diet, I only hope that our microwave potato breakfast producers will soon follow suit. The bottom line is that I liked this product. Making breakfast potatoes yourself can be time-consuming... cleaning the potato, peeling the potato, dicing or shredding the potato, squeezing the moisture out of the potato, cooking the potato, on and on. While the results of home cooking are better, it's nice to have this quick and easy quality option as a possible substitute. I'd give it 6 golden eggs, if it weren't for the partially hydrogenated vegetable oil. The $0.00 price is due to the fact the company sent samples MrBreakfast.com. We suggest that any price over $2.80 is too much money for this product. What do you think of Easy Breakfast Potatoes? I liked this product but they are not available in our area. Have they been discontinued? My son loves these and now we can't find them in any of the stores. Were they discontinued? Hey, that's a great review. They're not available in stores in my area yet, so I simply had to write a blog reviewing the packaging. Let me know if you agree/disagree with me on my packaging review. MEEK SPEAKS: Fresh and Tasty! Updated daily...see what's affecting YOU in the food & beverage industry today. I thought that they were okay for a quick fix - but please be warned that the serving size is barely enough for two people. My kids eat them like dinner rolls.